Do you own a digital marketing agency in India, and are planning to sell it in the near future? If you are, then know that exiting an agency isn’t too different than starting one. Both these processes are complex in nature, requiring a lot of due diligence on your part. Understanding everything and getting it all right is the key, even though most agency owners get most of the things, majority of the time, wrong. And it’s so sad, because all the work that you’ve done so far to make your set of digital marketing services into what they are today, could all go down the drain. A wrong move could make your exit and the rewards you’d be expecting, amounting to nothing in the end. While it’s true that to err is human, we can always try to make as less of mistakes as possible. 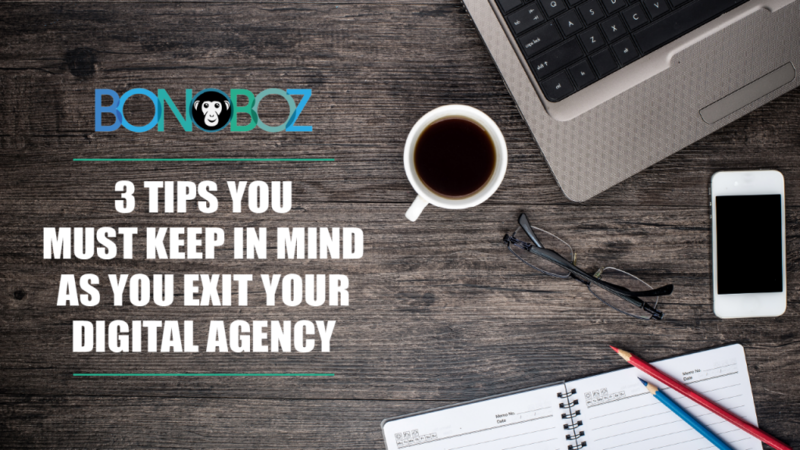 So, here are three tips you should keep in mind, while you’re readying to either sell your digital agency or merge it with another. When you’re exiting your digital marketing company, you should have a thorough talk with all your partners and board members. For instance, while you’re making your exit, you will have several deals that you’ll have to look into. All of these deals would come with a lock-in period. Herein the owners, that is you and your business partners would be employed in the company for a certain period of time. Let’s say your partner says they don’t see themselves working under anyone, and you brush away the remark in all your excitement of finally exiting. This partner then, if leaves within the lock-in period, it could create a lot of problems for you as well as the new management. While this is just an example of what could go wrong, post-acquisition stories are too well acquainted with partners not being in the same page. Therefore, you need to have all the difficult conversations up and done with before you enter any negotiation and go ahead with exit process. Do not rush in, and don’t try to push anyone’s concerns under the rug, just because it might not sound too serious to you. It might take you all several days to arrive at an agreement, wherein everyone has their concerns tackled with, but rest assured, this time will be worth spent. There’s always a certain valuation at which agencies exit within a particular industry. Say, the current valuation is around eight times the price-to-earnings ratio, then you’d be selling yours for eight times the average net profit your agency has had. While it might be an attractive number, you still have other things you need to consider. Questions such as, will it be a both equity and cash, or an all-cash deal, it would there be an earn out, and so on would need to be answered beforehand. Know what your potential buyer has in mind, in terms of post-acquisition plans for you. For example, if it involves an earn out, the deal won’t look as attractive to you as before. So, your agency would do good by getting support from your potential buyer in the form of account acquisition and financial resources. Sure, exiting your Internet marketing company can be a super emotional and exciting time! But, it’s important that you don’t let your emotions get the better of you. Your decisions should always be based on hard facts and figures. You’ll need to perform your due diligence. One of the many things you should do is, considering looking at your potential buyer’s financial statements. Because a decent professional could tell you with one look at the numbers, if this buyer really can afford to expand their business by acquiring yours. The answers that numbers could give you, could leave you surprised. And it’s better to be surprised before than be shocked later. You might consider contacting a broker to get you better potential buyers, to help in bringing you further leverage during your negotiations. But, brokers can easily prove to be a double-edged sword. An unscrupulous broker wouldn’t think twice before persuading you to take a deal that would help their interests, while ruining your prospects. That’s why, you will need to look into a broker well, before deciding to hire them. Finally, the thing you should remember is, every deal is unique. But even though no two exit processes are exactly the same, the only way to make a successful exit is by going through each and every detail, without leaving anything out. Take every point seriously, make sure your approach is right, and you know you’ll be good.